PageSlayers Featured in the New Issue of The Miami Rail! We're honored to be featured in the newest print and online issue of The Miami Rail in a piece entitled "PageSlayers Lays Down Literary Roots in the Opa-Locka Community." Miami-based writer Andrew Boryga interviewed Founder and Executive Director, Dana De Greff, and discussed his experience working with PageSlayers this past summer, the importance of creative writing, and the future literary greats right here in Miami! Read the full story on The Miami Rail website and consider supporting us at our donate page! We’re proud to announce that PageSlayers will participate in Give Miami Day, a 24-hour online giving event on Thursday, November 16th that provides individuals in our community with the opportunity to build a greater Miami by making charitable gifts to local, nonprofit organizations. During the 24-hour donation period beginning at 12:01 a.m. on Thursday, November 16th, you’ll be able to access the online profiles of more than 520 local nonprofits—including PageSlayers—and make a contribution through the Miami Foundation’s event-specific page. If you are considering donating to PageSlayers this calendar year, we encourage you to contribute through Give Miami Day. The Miami Foundation, John S. and James L. Knight Foundation, and partners will extend the reach of your generosity by making a bonus gift for every donation between $25 and $10,000 received during this time. 100% of proceeds from Give Miami will provide operational support for PageSlayers. Every gift is tax deductible and sustains PageSlayers’ efforts to provide free creative writing summer camps to rising 4th and 5th graders in Opa-Locka. Your contributions will translate into hiring professional, published writers-of-color as teachers, visiting instructors such as Edwidge Danticat, procuring supplies and PageSlayers camp shirts, and creating a PageSlayers Zine showcasing the writing of each camper. We appreciate your support in helping ensure PageSlayers continues to thrive as an innovative creative writing program, fostering the next generation of writers-of-color in South Florida! If you're ready to donate, click here. Our final session of PageSlayers may have been our smallest, but they made up for their size in the sheer creativity they poured into their work every day. This was a special group. Many entered the classroom already dedicated writers with full stories, cartoons, and poems under their belts. Among the beautiful phrases they crafted was the class favorite, “chicken bombs.” They even created their very own superhero: Liz Glossy Stick, a congresswoman who stars in an epic tale about vindication. Their words were honest, beautiful and charged with a certain freedom of expression that we sometimes lose with age. Among the guest artists that visited them was local Miami screenwriter April Dobbins. 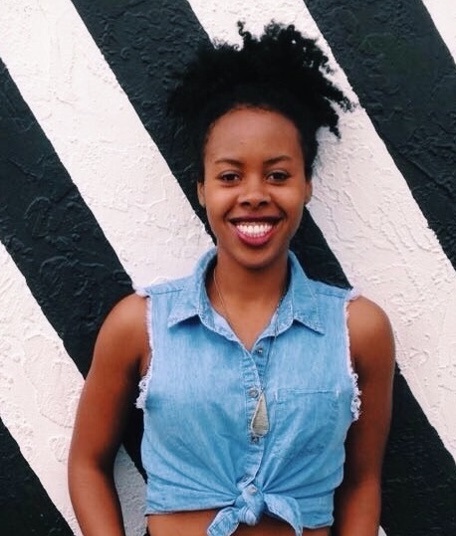 Dobbins is an MFA candidate at the University of Miami and was recently selected as a 2017 Sundance Knight Fellow. The students enjoyed learning from her about writing screenplays and how to make a career in the film industry. Another visiting artist who dropped by was spoken word artist, Dru Phoenix, a member of the poetry collective, Combat Hippies. In his session Dru taught students how to perform their poetry with emotion and brought out the expressive side of students that had already donned themselves with alter egos such as Jazzy J and Water Boy MLG. Dru’s guidance came in handy when it was time for our students to read their work at the final summer showcase on July 28th. The students in session three were among the most excited to perform and one student in the group said the showcase was the best day of her life after it was all over. Like all the students we had the pleasure of getting to know this summer, we had a wonderful time with our session three campers and have been sad ever since they left. Time flies, and we have officially come to the end of our first summer. This year has been an exciting, inspiring ride for us. What started as a simple idea, truly blossomed into a program we hope can have a real impact on talented youth in Miami for years to come. We would not have made it this far were it not for the amazing supporters we’ve been blessed to count along the way. Thank you, we appreciate you so much. In the coming months, we’ll be hard at work preparing for next summer. We’ll be sure to be in touch along the way with updates about our progress. If you would like to help us, please consider donating to our fundraiser. Every dollar goes toward our program and is matched by the Knight Foundation. In the meantime, keep slaying! “Mom, mom, a famous author taught us today!” exclaimed a camper, Noah, to his mother one afternoon in June as she picked him up from PageSlayers. Noah’s mom casually nodded her head, until Noah shoved Untwine, a young adult novel, in her face. “Look, she wrote this,” he said. During each PageSlayers session we always bring in special guests for our kids, but during our inaugural session we had an extra special guest come: world renowned author Edwidge Danticat. Edwidge has been an ardent supporter of PageSlayers since the very beginning and a source of inspiration when it comes to moving the hearts and minds of young people. During her visit to our classroom last month, she gave students a lesson on story structure, answering the five W’s, and how to create a superhero/shero protagonist from scratch. On the heels of the release of her latest book, The Art of Death, we chatted with Edwidge about her visit. What was your experience like teaching our PageSlayers? It was a great experience, one that moved me very much. I spent summers in our apartment in New York watching television with my brothers from the time I was 12 to the time I got a summer job at 14. I wish we'd had something like this. It was wonderful to see how these young people experience writing and express themselves. What is one highlight you remember from teaching in the classroom? There was one young man who seemed hesitant at first and even said he would be bored. I recognize this as fear of trying something new. At the end of the session, he admitted that people keep saying he's smart, but he does not believe that himself. He ended up writing a very good piece of writing, one of the longest for the session. As a critically acclaimed author who is welcomed in many spaces, why do you believe it is important for you to spend time with young children who may not be aware of your work? Because I am one of those children. At least, I was. I don't want young people to think that a writer is someone who sits on top of a mountain and sends missives down from up high. I want them to know that a writer is a regular person just like them, but works hard and grows and nurtures this talent and puts a lot of time and effort into it. It's important for me to let them know that they too can do what I'm doing if they work hard and put a lot of heart into it. What do you enjoy most about getting up in front of such young audiences? I love seeing how they even surprise themselves when they come up with something unexpected. I love their sense of wonder at their own imagination and abilities. 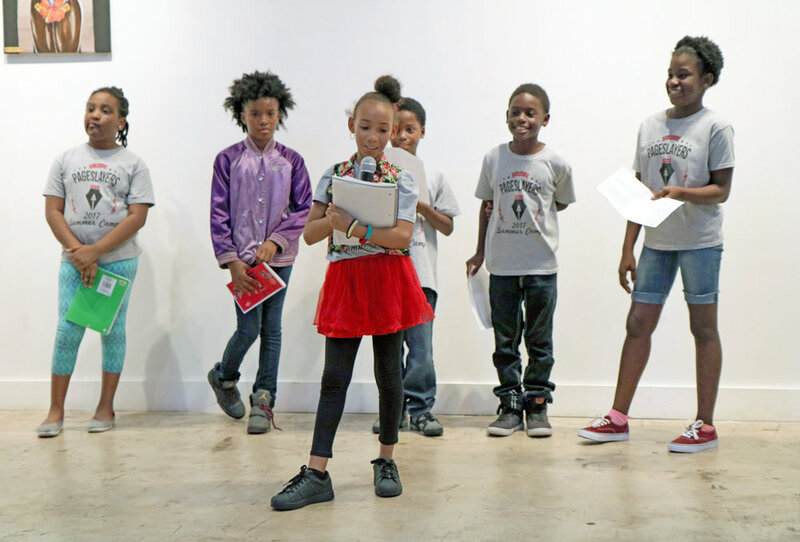 As a devoted champion of the arts in Miami, why do you believe it is important that kids in Miami—and Opa-Locka in particular—have access to a program like PageSlayers? All kids should have access to wonderful things. I am keenly aware of that as a parent more than anything else. It's unfair that so many kids in our community are lacking so much that other kids take for granted. All kids should have wonderful programs like this on a routine basis. It was so wonderful to visit the program. I hope it continues to grow every year. Unbelievable as it is, we've come to our final session of PageSlayers this summer! How time flies. Today marks one week in with our new crop of future novelists and poets. As we move into our final week for the summer, we'd like to introduce to you the duo of instructors guiding us to the finish line: Chioma Urama, coming back to us after leading our first session in June, and homegrown Miami artist and writer, Itzel Basualdo. Tell us a little about yourself: Where are you from originally? What sort of writing do you do? What are you working on right now? I’m from Northern Virginia, about 20 minutes outside of Washington, DC. I write fiction and dabble in poetry frequently. Right now, I’m working on getting my yoga teacher training certification. I’m learning to integrate mediation, breathing, and visualization practices into a creative writing curriculum for a more holistic approach to teaching. What made you want to join the PageSlayers teaching staff this summer? I love teaching creative writing and working with children and PageSlayers presents the wonderful opportunity to do both. It’s also very important to me to be able to work with black children and to provide them with the tools and instruction that is often considered a luxury or a privilege in our society. What are you looking forward to most in the program? I’m really looking forward to getting to know the kids! My teaching style is very collaborative. I work with the ideas, issues, and concerns that my students bring into the classroom to build creative assignments. When did you first fall in love with creative writing? I fell in love with writing very early on (probably 2nd or 3rd grade) after reading a story called “Amelia’s Notebook.” It’s a children’s story written like a diary with doodles and postage stamps and restaurant napkins pasted in the margins of the pages. I’ve been writing and journaling and sticking leaves and feathers in between the pages of my notebooks ever since. Why do you think it is important that students in the program have the opportunity to be exposed to creative writing at an early age? Creative writing presents children with a safe space to begin to think critically about their world. It encourages them to engage their imaginations and promotes self-confidence that strengthens other areas of learning. Where can students, parents or supporters find out more about you and your work? I’m in the works of putting together a site, so be sure to check back for updates soon! I am, as they say, one of those who was born AND raised in Miami. Against my Argentine father and Mexican mother's will, I have begun to establish myself as a visual artist. Lately, I've been working on a small book that addresses and presents the crisis in Venezuela from multiple sources: Twitter, interviews, and that of an absolute outsider. I will also be an MFA candidate at the School of the Art Institute of Chicago beginning August 2018. I wanted to join PageSlayers because I enjoy working with children; I was excited about the possibility of teaching creative writing! And I like creative writing! I think what I'm looking forward to most is seeing the children enjoy themselves and enjoy the writing process. I think PageSlayers offers these kids a wonderful introduction to the possibilities that exist in writing, and is helping those who had already become enamored by it tap into it even more. I hope that beyond learning about metaphors and rhyme, PageSlayers allows them to see the world through a different lens. I think I first fell in love with creative writing in elementary school. I don't remember who, but someone gifted me with a journal in the second grade and after that, my life was forever changed. I've kept a journal since then, and from there I moved on to writing short stories about spies and a half-cat/half-human girl named Cassandra. I think it is important for the children to be exposed to creative writing from an early age so they view and treat literature differently—so they can see for themselves that reading and writing doesn't have to be boring. It is much like planting a seed, this appreciation for literature. It is something that they can take with them, and it might be a short story, or novel, that helps them navigate a difficult period of their lives. You can very soon follow me on my website, and check out my film photography (posted on occasion) on my Instagram. We Wrapped Our Inaugural Session of PageSlayers! Here’s How it Went. Our inaugural session of PageSlayers wrapped up a little over a week ago. We had a lively group of students who came in each day ready and eager to participate. Our days generally started off with a short writing exercise to get them warmed up. Each exercise built on a previous day’s lesson so students would have a chance to practice right away using tools such as metaphors, similes and the five senses in their writing. After fifteen minutes of warm-up writing, students and their instructors sat on the carpet to share out. Chioma Urama, our lead instructor and self-described nature buff, brought in a classroom plant students were charged with nurturing. After reading their responses to the morning prompt, each student took turns watering the plant. At the end of the share out session, students read out loud a list of classroom rules they created on the first day. Some of the rules included being respectful of others, trusting inner voices when writing and taking responsibility for all actions. Following our morning writing was a lesson from our instructors that varied each day. During week one, instructors began by discussing the mechanics of poetry such as how to use figurative language and how to create images with words. Toward the end of week one, lessons moved on to fiction to discuss setting, world building and developing unique characters. By week two, lessons focused on non-fiction, writing about memories, personal narratives, and crafting reflections on neighborhoods and families. Although the content of each lesson was different, they all followed a similar format beginning with a discussion to see where students were in their knowledge of concepts. This transitioned into specific exercises and activities allowing students to flex their writing muscles and build on their previous day’s work. Some students created new stories and narratives each day, while others wrote about one consistent theme. For example, Avery, an athlete who became known as the class novelist because of the long entries he penned, frequently used these activities to create stories and poems incorporating the various sports he plays. Peppered in throughout the two weeks of lessons were visits from special guests such as the acclaimed author Edwidge Danticat who joined students to discuss narrative structure, read from one of her novels, and answer questions about the writing life. We were also joined twice by Ingrid Schindall, who taught students how to create zines from scratch that they later filled with their own writing, drawings, collages and other artwork created throughout their two weeks at PageSlayers. When the program came to a close on Friday, June 30, it was a bittersweet day. Students and teachers celebrated how far they had come but also reflected on how much they would miss their time together. Nonetheless, it is clear from the sheer volume of work produced in two short weeks that each student left the program better writers than when they entered. It is our hope that they took away lessons and inspiration to continue their writing in the future. And who knows, perhaps they were even inspired to become the next great novelist or poet? Only time will tell. We just wrapped week one of our first session and so far it has been an absolute success. Our students are motivated and energetic, and our instructors have led them through fun exercises and activities establishing the fundamentals of both fiction and poetry. As we move into our final week of session one, we thought now would be a good time to introduce to you the wonderful instructors who will be leading session two, starting July 3rd. Meet Shameka Poetry Thomas and Miguel Pichardo, two home grown Miamians who have accomplished a lot on the page and have a passion for educating the Magic City youth. I was born and raised in Opa-Locka (3-0-5 DADE COUNTY, lol)! I am an international spoken word artist and poet (which is the theatrical and oratorical version of creative writing). I am the founder of the SISTA-SPEAK UP Poetry organization at my alma mater, Spelman College, located in Atlanta, Georgia. Since then, I have studied abroad in South Africa and was nominated as one of the top ten spoken word poets of Cape Town in 2008. I have performed my poetry in Dubai, Cuba, and Kenya. Currently, I am a PhD candidate at the University of Miami. However, I still perform my poetry throughout various open-mics in Miami as a hobby. I am also the proud mom of my five-year-old daughter, who has already started memorizing the poem “Our Deepest Fear” by Marianne Williamson. I LOVE SEEING KIDS THINK OUT LOUD!!! I think it’s fascinating to dream big with children and allow them to paint their skies orange or purple! I joined PageSlayers as a Lead Teacher because I want kids to SLAYYYYYY, write, and speak from their hearts and souls! I am definitely looking forward to getting to know each and every personality in my classroom! I am excited to see their transformations and to help them discover their own voices. I am also excited to turn reading and writing into summer fun! I performed my first poem, entitled “I AM THE BLACK CHILD” when I was about five years old. I have always loved writing, reading, performance poetry, dancing to reggae music, and being full of wonder lust! I am an old soul with a young heart. That helps me fall in love with poems, quotes, journal entries, and novels—differently, and in every season! To find an outlet. To learn a new “love” language. To hear themselves. To hear others. To Be. And most importantly: TO FEEL / EXPRESS. I was born in Queens, New York but moved down to sunny Miami when I was six. As a Latino man of Dominican and Ecuadorian descent, I try to convey the nuances of my cultures through poetry, fiction, and creative non-fiction. Currently, I am the Editor-in-Chief of Fjords Review­, an international literary magazine. I am also working on my thesis project as an MFA candidate at Florida International University. The Knight Foundation granted me a fellowship to attend FIU, and since then, I’ve considered the organization a champion for art and culture in the Magic City. When Dana De Greff was awarded the Knight Arts Challenge to make PageSlayers possible, I thought I couldn’t be more excited for her. But then she invited me to participate in a program that catered to the creative needs of young people of color, and my excitement reached a whole new level. I’m as thrilled as I am proud to be a part of a team that values our youth’s artistic expression as gifts that should be nurtured and shared. I’m a kid at heart, so I honestly cannot wait to play games with the students. Our curriculum incorporates play into the creative process, which I believe is essential for raw expression. When students come together to play, they can cut loose, be themselves, and bring that authenticity to the page. I suppose it was in middle school when I started rapping with my friends. I didn’t know I was writing poetry; I just knew that with the right rhythm and cadence, language could produce art. We kept making music until I went away to college in New York. I was rapping less, but reading more. It wasn’t until I saw my reflection in the pages of Junot Diaz’s Drown that I realized I could write something authentic, even beautiful without beats and rhymes. I took every creative writing course I could and have been refining my craft ever since. Having spent my childhood in Miami, I know that it can be a confusing time for many kids, especially for children of color. Creative writing can help them navigate their frustrations and bring light to their hopes for the future, as it has for me. My work has appeared in the online magazines Luna Luna, Duende, and Literary Orphans. PageSlayers Is In The Running for a $10,000 Prize and Needs Your Help! We’re very excited to announce PageSlayers has been selected as a “KIND Cause,” by The KIND Foundation! Every month the KIND Foundation support individuals and organizations working to make the world a better place by awarding them $10,000. To win this great prize, an organization must gain the most online votes from the community at large. We're honored to be in the running for this prize, but now we really need your help in order to win! The good news is that all you need to do to help is head to our KIND page and use your email or Facebook account to register and vote for us. It takes two minutes to complete and even less time to share. The more votes we receive, the better our odds. So once you vote, please spread the word to your friends, family, coworkers and anyone else you can think of! Our winnings will go directly toward the mission of giving our fourth and fifth grade campers in Opa-locka FREE, high-quality creative writing instruction from published, professional writers of color as well as help fund our end of the summer celebration that will gather family and friends to watch our Slayers perform original pieces of writing. Thank you to all those who have voted for us so far. Let's keep the votes coming! Now that we are officially less than a month out from our very first PageSlayer session, we thought it would be a good time to introduce the wonderful team of instructors who will lead our first group of PageSlayers' campers come June 19. Below, please find two short Q&A's introducing Chioma Urama and Andrew Boryga, two accomplished writers of color who are currently based in Miami and extremely excited to work with our Slayers this summer! I was born and raised in the Bronx, New York. I started out writing non-fiction and interning for local newspapers in the Bronx and have since gone on to write features for places like The New Yorker, The Atlantic, and The New York Times. I fell in love with writing fiction around my sophomore year in college and have been obsessed with it ever since. I’m currently an MFA student at the University of Miami and hard at work on my first novel. I love the idea of introducing kids to creative writing and expression ASAP. Personally, I did not discover the power of writing until later in life. Growing up in the Bronx in the 90s and attending mostly public schools, I didn’t have many opportunities to learn from writers that looked like me and wrote about my world. I really believe in the mission of PageSlayers and the power of telling young kids of color they already have the ability to create things with their words and showing them—simply through the presence of instructors who look like them and write for a living—that making a career out of writing is possible no matter where you start out in life. Being blown away by the work the kids will produce. In previous jobs working at education non-profits and in my day to day life taking time to talk to kids and really listen to them, I’m always amazed by the beautiful depth inside of them and the ways they can express themselves when people actually take an interest in what they have to say. I know our PageSlayers will have this same depth and honestly I can’t wait to learn from them. I didn’t even think being novelist or a poet could be a possibility until I went to college and started to read writers of color like Junot Díaz, Piri Thomas, Ernesto Quiñonez, Helena Viramontes and so on. I thought in order to be an author you had to write the sort of stuff I read in school, which was mostly written by white men who had no clue what it was like growing up in the Bronx. But in college I had an epiphany. Since then I’ve been in love with the idea of putting my own world on the page and writing about people who look and speak like the people I know deeply in my life. I really believe the earlier you can unlock a student’s potential the better. Not only will a summer program like this help kids perform better in school, it will more importantly help kids think critically about their own life and world. I think that is one of the most powerful things you can teach a kid and something that will last well beyond this summer. You can find out more about my work on my website or follow me on Twitter and Instagram. We would like to thank everyone who came out to our very first public fundraiser in support of PageSlayers last month. It was an amazing afternoon at Books & Books, our gracious hosts, and hands down the best place to advocate for the power of literature in Miami. The fundraiser drew a packed crowd of attendees who had the opportunity to learn more about PageSlayers, enjoy drinks and, of course, hear from our esteemed literary rock stars for the night, Edwidge Danticat and Patricia Engel. After a welcome from PageSlayers founder Dana De Greff, Opa-Locka City Commissioner, Matthew Pigatt, took the microphone to talk about the need for a program like PageSlayers in the community. Patricia Engel, who has written three books of acclaimed fiction in her career, followed Matthew with a reading from her latest novel, The Veins of the Ocean, and her own words of support for PageSlayers and the mission of arming young students with the power to write and create. Edwidge Danticat, author of over 10 books and winner of prestigious awards such as the National Book Award and a MacArthur “Genius Grant,” followed and relayed to the crowd why she was so enthusiastic and proud to support “this important work at hand” by being in attendance. As a special treat, Edwidge read for the first time from her forthcoming book The Art of Death: Writing the Final Story, which will be released in July. Thank you again to everyone who joined us! We’re currently in the process of getting ready for our first session in June, but in the meantime, please continue to support us by donating and spreading the word. All proceeds go toward helping us make sure our kids in Opa-Locka have an amazing summer experiencing the power of creative writing. Remember, every donation is matched by the Knight Foundation. So yes, every penny counts! Please click on the image below to see a few more photos from our event! © 2018 PAGESLAYERS. ALL RIGHTS RESERVED.